in dressage at the National Sports Festival in 1981. 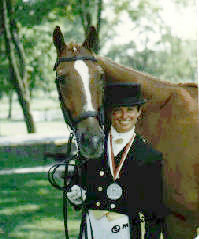 A graduate of Duke University, Mari Monda Zdunic is a top dressagecompetitor having earned USDF gold, silver, and bronze medals, Olympic Sports Festival silver, bronze and team medals, along with numerous USDF top ten horseof the year honors from the United States Dressage Federation from Training through Grand Prix levels, open and all breed awards. Mari competed in the Olympic Trials in 1980,Gladstone, NJ; and the 1981 World Championship Trials. She is equally admired forher spectacular exhibition rides which have thrilled spectators from coast to coast.An associate of Mr. Chuck Grant for fourteen years, Mari is continuing his fine work since his death in 1990, as owner and trainer of Shine-A-Bit Farm. Mari has been key in the promotion of nontraditional dressage mounts. She has trained and shown the first North AmericanArabian, Connemara, Appaloosa, and Paint Grand Prix dressage horses; those being Gahalla owned by Paul and Delores Lavins, Grosse Point, MI,Tre Awain DeValera owned by Three Creek Farm, St. Charles, MO., and Billie Joe Freckles, last owned by David and Anne Gribbons, Long Island, NY, and Double Darin Cody owned by Amy Mueller of Saginaw, MI. Mari has also been deeply involved in the advocation of the American Quarter Horse in competitivedressage and for high school exhibitions. Mari and her horse, Shine-A-Bit III (AQHA) have performed exhibitions at the Washington International Horse Show, as well as at the Quarter Horse Congress, and was honored Grand Prix horse of the year for the United StatesDressage Federations all breeds quarter horse awards in 1988. Mari also trained Royal Inspirationto a three time American Buckskin, Amateur Championship - rode and owned by Eva Haron, South Lyon,MI.Another familar mount for Mari has been Prussian Dudley, a Saddlebred/ Trakhaner cross gelding who really enjoyed his time in the spotlight. The Lark Ascending, AQHA Superhorse came to Mari Monda for classical and high school training by owners Ethel Strach and Janet Reid. His first dressage show was the training level. In two years he was Region Two champion at Fourth level free style. In two more years the Lark Ascending reached Grand Prix and became Americas first AQHA Superhorse to compete at the Grand Prix level. Along this route Larkie became a Breyer Horse, while winning numerous regional and national awards at Prix St. Georges, Intermidiare 1, and Grand Prix. Andalusian Brilliante owned by Bill and Terri Clark was United States Dressage Federation All Breeds Horse of the year, 3rd level freestyle. Mari is currently competing on Shine-A-Bit Tracer who is out of a Percheron mare by a thoroughbred stallion, competing at Grand Prix level winning numerous regional and national awards. Always the consummate professional, Mari takes pride in students who ride and train, the end goal being to make your horse go "skipping down the road!"